Dan Brown, of Masham, has been in action in South Africa (Picture: Leaderboard Photography). Masham’s Dan Brown fired three rounds in the 60s to place third in the South African strokeplay championship at Kingswood Golf Estate on the Western Cape. The English men’s amateur champion posted scores of 70, 67, 67 and 68 and was just three shots behind the winner Edgar Catherine, of France, and only one shot off a tie for second with Ireland’s Robin Dawson. A feature of Brown’s week were birdie bursts that punctuated each of his rounds. 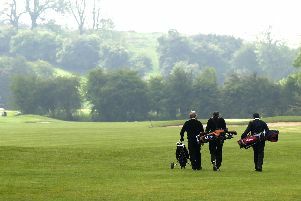 The Yorkshire county player was three-over-par after the first nine holes of the tournament, but three birdies in six holes on the back nine redressed the balance. On day two, Brown was out in level par before kicking into gear with four birdies on the spin, a run halted with a bogey at 15. In the third round he threw in his birdie blitz early on with another sequence of four in succession, from the third, and played the remaining holes all in par bar a dropped shot at 14. Four birdies in the first six holes in the final round were largely subdued by three dropped shots between the ninth and 14th, but a fifth birdie of the day at the 15th enabled him to tie for third with France’s Frédéric LaCroix. Brown is in South Africa as members of a four-strong England squad. As well as competing at the South African stroke play championship, he will play the Cape Province Open, at George GCand Oubaai GC (February 14-16), the South African Amateur, at Humewood Golf Club, Port Elizabeth (February 19-24), and the African Amateur stroke play championship, at Leopard Creek Golf Estate (February 28 to March 3).